Take Advantage of the Promotions at FanDuel! FanDuel is one of the largest providers of daily fantasy sports. It has official sponsorships with many NFL and NBA teams and expects to pay out more than $1 billion to members again in 2017. It’s based in New York and has traditionally focused on North American sports, but the company and its main competitor are transitioning to broader appeal as DFS continues to gain popularity in the U.K. and throughout Europe. Click here to check out FanDuel! Requirements Create an account, and get a free voucher! The daily fantasy sports contests at FanDuel are derived from traditional season-long fantasy leagues, but there are important differences. The games in DFS only cover a short period of time, like a week or even a single day. You therefore aren’t tied into a lengthy commitment, and you can draft a new lineup every day. Real money contests start at just $1, and there are events with entry fees of thousands of dollars, so there’s something for newcomers and high-rollers alike. 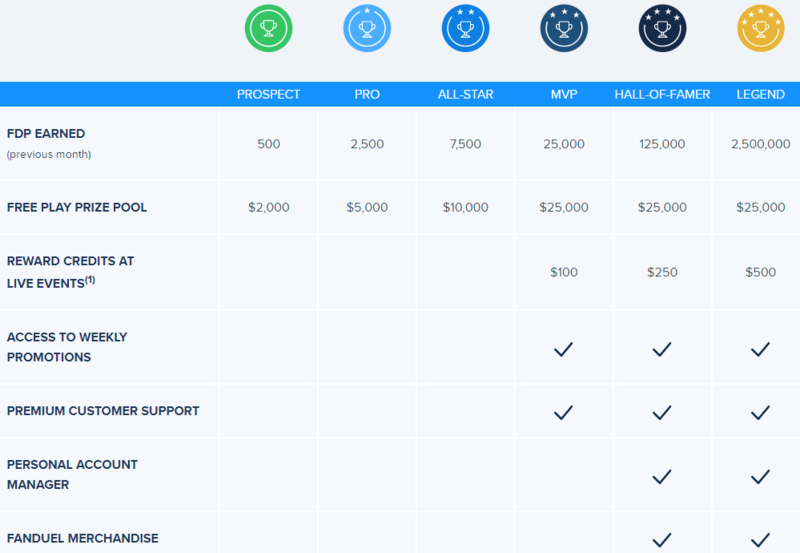 Starting your playing adventure at FanDuel is a painless process. All you need to do is submit your name and email address and choose a username and password. There are usually a few items listed in the lobby that cost $0 to enter; yet, you can win cash if you’re lucky or good. 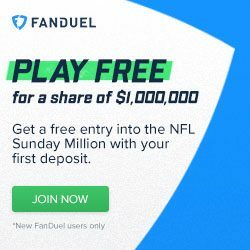 When you register for FanDuel, you’ll get a complimentary voucher, good for entry into the NFL Welcome Free Play contest, which distributes $10,000 each week to the winners. It’s a mistake to try to enter a contest from the main lobby using your complimentary voucher. This is because doing so will debit your account balance when you click the “Enter” button. Instead, you must go to the “Vouchers” section in the account menu at the top of the page. Then choose the voucher you wish to use. You’ll go to the drafting interface to create your lineup. When you then press “Enter” to join the contest, your voucher will be applied to the entry fee rather than using your real money balance. The complimentary voucher is a nice touch for newcomers, but there are a couple of other ways that the company rolls out the red carpet for anyone who joins up. Be sure to take advantage of these deals so that you don’t miss out on any freebies that you’re eligible for. When you elect to fund your account for the first time, you’ll get some more vouchers credited to you. If you deposit less than $100, you’re only entitled to one of these free coupons, but if your transaction is for $100 or more, then you’ll get three of them. The vouchers are good toward the Sunday Million, which pays out $1,000,000 to the winner and $4,000,000 to the entire field. 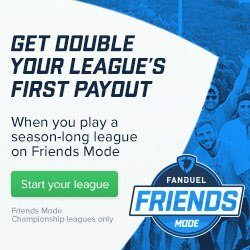 The Friends Mode at FanDuel is a league that you can set up for yourself and your friends to compete against each other. Each weekly match has its own payout, and there are prizes for performance over the whole season too. As a new player, you’ll get the payout doubled for the first contest that you host in your new league without doubling the entry fee. 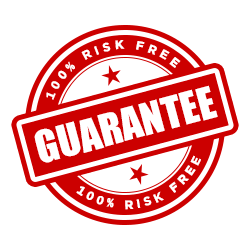 FanDuel guarantees that you’ll love its service – or you’ll get your money back! The way it works is that you can make a deposit and then play contests for a single day. If, after this day of playing, you’re unsatisfied with the product, then you can contact FanDuel to have your account closed and your deposit refunded. This offer is capped at $100. Take note of the fact that you won’t be able to keep playing at FanDuel if you request your money back. It is possible to reinstate your account, but you’ll have to pay back what you received from the Money Back Guarantee. FanDuel has made it simple to make a deposit into your account. Click on “Add Funds” in the top-right corner of your browser to begin. You’ll see a screen with several monetary values that you can click on if they correspond to how much you wish to deposit. You can, of course, choose “Custom” and enter in the amount you wish to spend by hand. FanDuel accepts MasterCard, Visa, Discover and PayPal. The deposit limits are $10 – $10,000. As you enter paid contests, you’ll receive FanDuel Points (FDPs) at a rate of 5 FDPs for every dollar paid in entry fees. There are certain promotional periods where this rate of FDP accrual is temporarily increased. You can spend your FDPs to register for contests instead of buying in with the money in your account. On every draft screen next to the cash entry fee, you’ll see the number of FDPs it costs to enter. Be aware that FDPs expire after one year without being used. However, you can restart this clock by either using your FDPs or playing any paid contest. The refer a friend program at FanDuel is tied to a unique referral link that the company will create for you. Then, you share this link with the people you know, and if any of them signs up and plays, you’ll get credit for this activity. Once the person you’ve referred pays a total of $20 in entry fees, you’ll be rewarded with $10, and your friend will get $10 too. At times, there are additional incentives, like a cash prize for referring a certain number of players within a given timeframe. A free contest entry upon joining, another for depositing, and more offers at FanDuel. 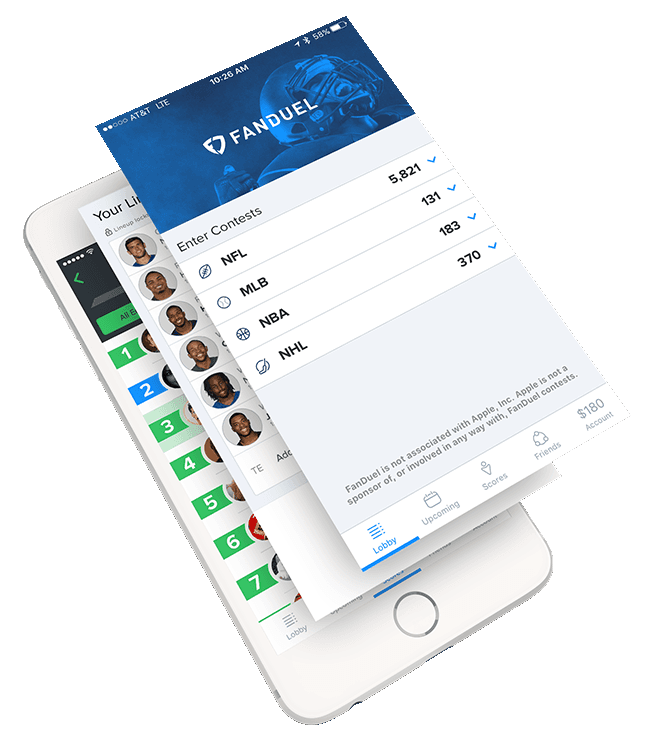 You can use your mobile browser to play at FanDuel, but you might prefer to download the app, which is offered for iOS and Android. Though the display is a bit cluttered on smartphones, you can still get the job done successfully with a bit of patience. If you’re using a tablet, the experience you enjoy will be virtually identical to that of using the regular website. The optimized app may be preferable to trying to do everything at the normal site. 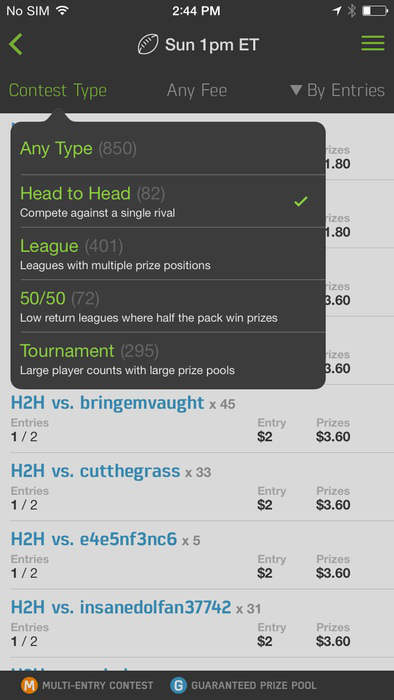 You can set up a friendly rivalry among your peers with the Friends Mode at FanDuel. Although you’ll be submitting a new roster for each weekly contest, a leaderboard will track the standings over the course of an entire season. You can choose to award the final winner a substantial prize. That should keep your friends coming back to try to achieve victory. In your first Friends Mode Championship League contest, you’ll get the prizes doubled on the house. 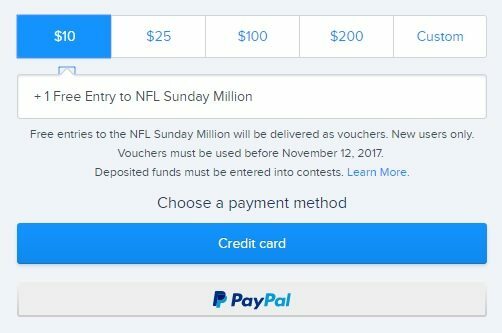 Don’t let the inexpensive $7 price tag deceive you: The Sunday Million NFL contest pays out $4 million every week. The top prize is $1 million, so anyone who wins becomes an instant millionaire. Yet, there’s plenty of wealth to spread around because more than 160,000 participants will take home some money. Best of all, you can collect up to three free vouchers for this event when you make a deposit. This free NFL competition is held in the new Mini format, so you’ll only have to draft five players each week. The prizes are only $1,000, but there’s an added possible bonus. Whoever submits a perfect lineup will win $20,000, and if nobody wins it in a given week, then the money will carry over to the next week, allowing the potential payday to become massive. Costing $33 to play in, the Sunday NFL Bomb pays out $1,000,000 to the top finishers. Participation is capped at 35,650, so you have a much better shot of winning than in events that permit hundreds of thousands to enter. If you should emerge victorious, you’ll receive a $250,000 prize. FanDuel has the best customer service in the business, including live chat. It doesn’t have the overall selection and sheer amount of free and cheap games that DraftKings does, but FanDuel has an active population, for the NFL and NBA in particular, that its competitors simply can’t match. Read more about the FanDuel promotion code here. 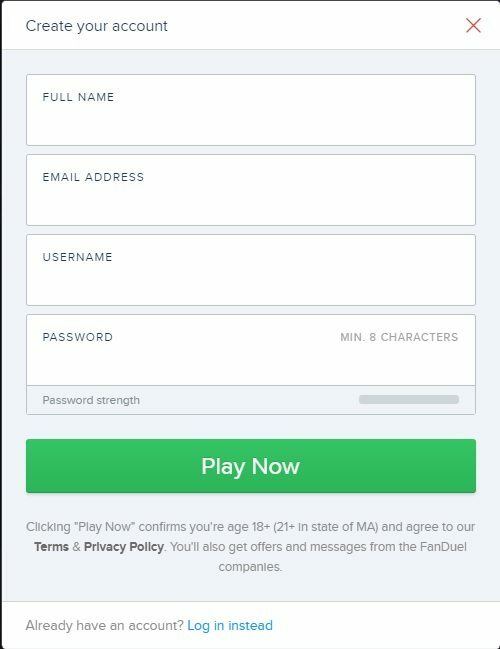 Find additional Fanduel promo codes at http://draftduel.org/fanduel-welcome-promo/. We also place sports bets along side our DFS lineups at Bovada Sports. Find the latest Bovada promo codes courtesy of USACasinoBonusCode.com.